It has been about two weeks since Google launched Ad Manager. Most people do not even have access to the new beta ad management software, but for some reason, I always had access. In any event, I spent a few days playing with Ad Manager and decided to give everyone a step-by-step walk through on how to server your ads using Google Ad Manager. 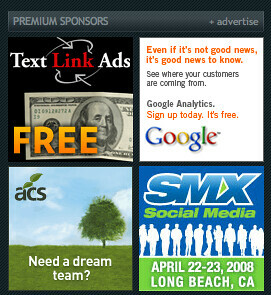 In the example below, I will be configuring the ads to run like they would on most medium sized blogs or sites. Most the sites or blogs I know, run ads on monthly or quarterly contracts, not specific to CPM but pretty much to have the ad live on the site for a month. 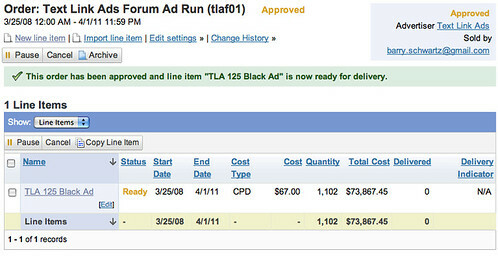 Google Ad Manager allows you to sell ads on a CPM (cost-per-thousand impressions), CPC (cost-per-click) or CPD (cost-per-day) model, so for me, I am going to go with the CPD model. I am currently using OpenAds to serve my ads on this site. 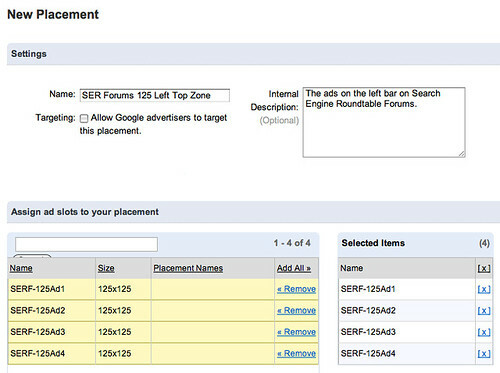 I am actually eager to move off OpenAds and give Google Ad Manager a chance. Why? Mostly because I would love to move the ad serving technology off my servers and onto an external server I don't have to manage and pay for. OpenAds, although an outstanding piece of software, does use a lot of server resources and is open source, so it has the potential to be hacked into (if I don't patch it frequently). Let's get started with the walk through. Note, I am not sure if my demo is the best way to set it up. All I know is that it works. If you have tips and suggestions, please comment and I will review and hopefully add them to the walk through. 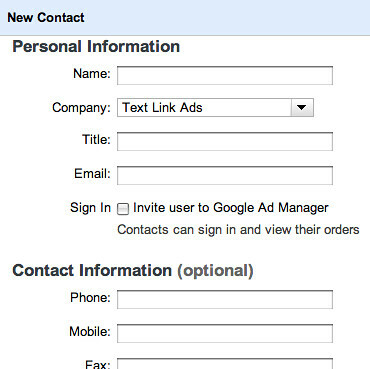 Step one is to gain access to Google Ad Manager, which is in a beta release right now. I cannot help you with this, if you have an AdWords or AdSense representative, I would suggest asking them to get you into the beta. Once you gain access, you need to login to https://www.google.com/admanager/. 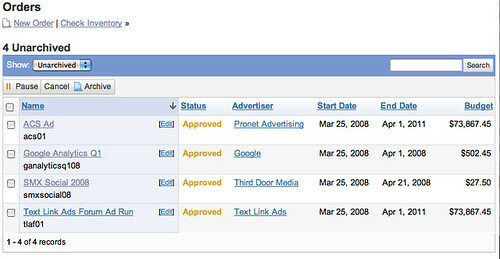 When I am done replacing the Open Ads code with the Google Ad Manager code, I want to see the same four ads. The ads will hopefully rotate between each other, but the same four ads should be visible, when I am done. Now that your ad slots are set up, you need to create an Ad Placement. 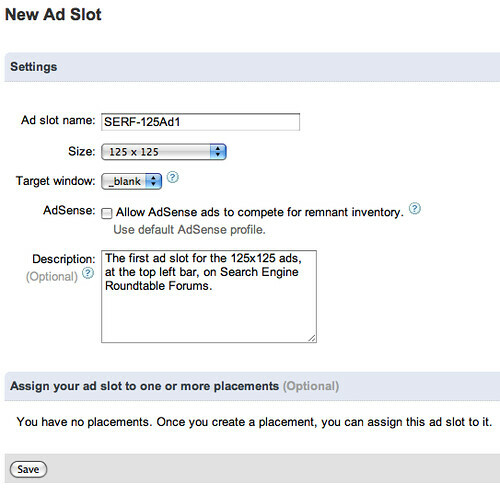 Ad placements let you group ad slots together, so that you can rotate your ad slots evenly in the same location. For example, I want all my advertisers to see the ad slot 1 position, they all should get a fair shot to be at that top position. 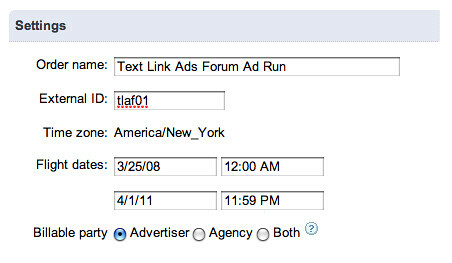 Recap: So far we created four ad slots and then associated those four ad slots to a single ad placement. Now it is time to get your banner ads up, the actual creatives. To do so, you need to create "Orders." I then need to add the "Advertisers", by clicking on add new. 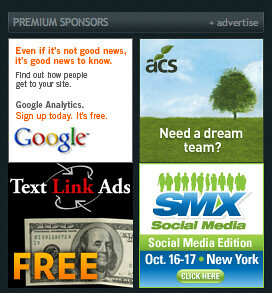 This contextual pop up opens and asks you to enter the Company name, in my case, "Text Link Ads." 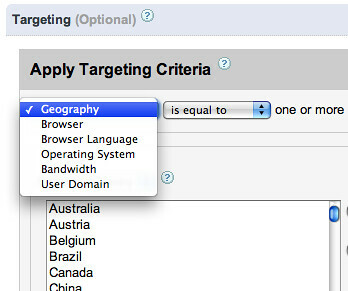 I then selected "advertiser" from the type drop down, in some cases, it may be an agency. The final field on the add order page is the "notes," which is also optional. 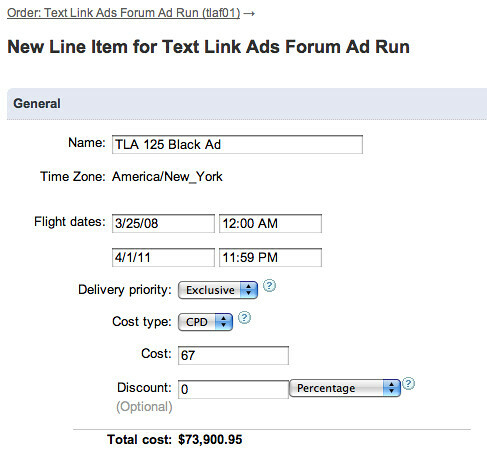 After you set up an order, you need to add new "line items" so you can set up the advertiser's banner ads. 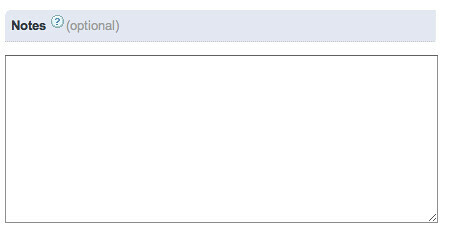 Let's move on by adding an ad for Text Link Ads. You should see a screen like this, immediately after adding an order. You are then taken back to the Order page, showing the line items for that order. 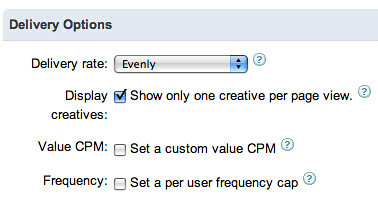 Click on the line item you just set up and you will see that the line item requires a "creative." The creative is the banner ad. Here is a screen shot of the page, see next to the 125x125 on the bottom left, it says "needs creatives"? 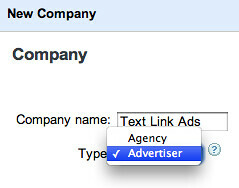 Now that we set up the Text Link Ad Order, line item and creative, you need to do the same for all your advertisers. So I am going to go back to create "Orders" section above and do it all over again for each advertisers. I won't go through each one, because it is repetitive. 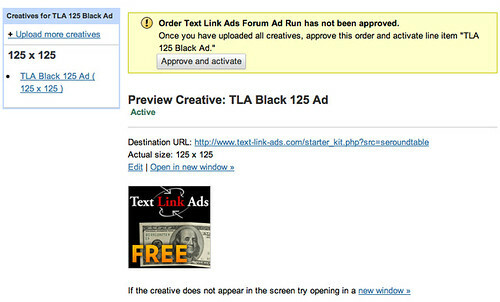 I will now skip to adding the ads to your site or blog. 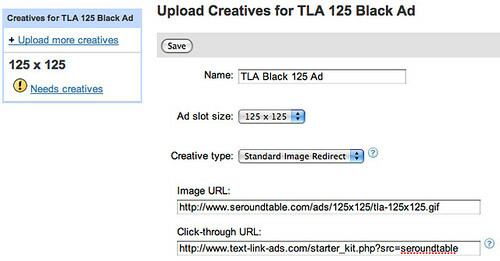 Adding the ad to your blog is the next step. Go back to "Ad Slots" and at the right, you will see a link to "Generate Sample HTML," click it. Click "add" next to each of the ads you added, in my case, the four ads. I saved my templates and when I looked at my site, the ads were missing. I initially thought I did something wrong. But then I remembered, the ads won't be shown until the start date, which was set to 12pm (EST) today. So they should be visible soon. Here is a screen shot of them missing. 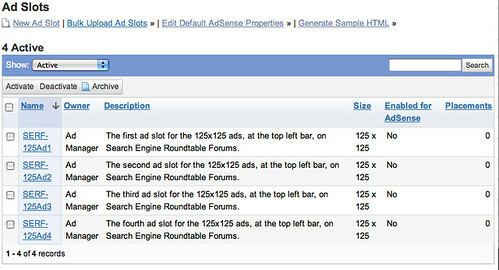 So that is how you set up Google Ad Manager on a blog. 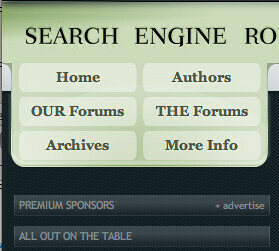 You can see the ads live at Search Engine Roundtable Forums. I will move the main site's ads over eventually.